Native to Asia, the peach tree falls second to the apple as the most popular, deciduous fruit tree in the U.S. The hundreds of peach varieties provide a good selection for Alabama cultivation. Varieties such as the Summer Pearl, Belle of Georgia, Scarlet Pearl, Carolina Belle and Southern Pearl are ideal for Alabama. These cold hardy trees can withstand the varying temperatures and climates of Alabama areas while receiving enough chilling hours for ample fruit production. 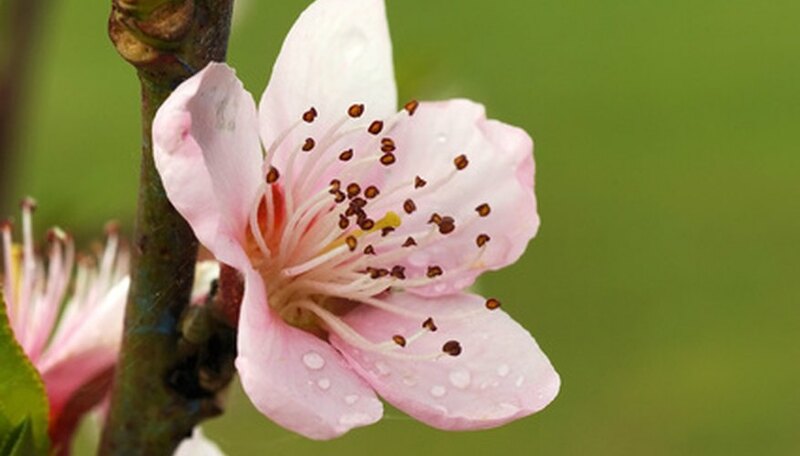 Select a planting location for the peach tree one to two years before planting. Choose an elevated, well-drained location that receives at least eight to 10 hours of full sun each day. Ensure that the location has a loamy type soil to promote good drainage and prevent settling water or puddles. Test the soil's pH levels. Take a sample of soil from approximately 6 to 8 feet below the planting area surface. Adjust the soil’s pH levels after receiving the test results so that the final levels rest between 6.0 and 7.0, with 6.5 being ideal. Plant a peach tree variety that closely matches the amount of chilling hours provided in your growing zone. Select a peach variety with a low to moderate chill requirement, such as the Texstar or Flordaglobe, if you aren't sure which variety to pick. Prepare a planting bed that is approximately 6 feet in diameter and 1 to 2 feet deep. Incorporate a balanced amount of organic matter into the bed to promote water retention and drainage. Plant the tree after the final frost. Position the tree in the center of the hole so that the graft union is 1 inch above the planting surface. Train the peach tree to promote a strong framework. Develop an open-vase shape by pruning tree with one central leader and balanced side branches. Thin the interior branches and stems to promote increased air circulation, light penetration and fruit size. Complete the pruning immediately after planting and every year thereafter in the early spring. Provide the tree with 1 to 2 inches of water each week throughout the growing season. Adjust the irrigation levels during periods of drought or rain. Feed the peach tree in the early spring and approximately 60 days after the spring application. Apply a well-balanced, slow release fertilizer such as a 10-10-10 or 8-8-8 combination. Distribute the fertilizer evenly around the tree’s diameter and throughout the area beneath the tree’s canopy. Keep the feed at least 12 inches from the trunk of the tree to prevent root burn. Soil test kits are available at most garden centers. Local university extensions also offer soil testing programs.